Just beautiful. My daughter loves it. Sweet, soft, and elegant, this gorgeous quilt set will make any little girl feel like a princess. The shams and lightweight quilt are crafted from machine washable polyester in an off-what tone, and embellished with an array or multi-colored butterflies. Pink ruffles adorn the bottom of the quilt, adding a touch of fairy tale charm to this adorable and luxurious set. Wish I Were a Kid Again! This quilt set perfect for a little princess who happens to love butterflies. It's as pretty as pictured. Make sure you order the matching curtains​ as well. I bought this for my young daughter and she just loves it. The quality is amazing, it’s so so soft. The stitching and softness of the fabric make it look so expensive. I love that’s it soft for her. It is something she will likely want to use for a long time. It’s also not too think so can be used head round and I can just add a white duvet underneath in the winter. This is a truly beautiful quilt. This is a beautiful set! Perfect for my five year old. Beautiful patterned fabric with surprisingly nice quilting in the shapes of butterflies all over it too! My only complaint is that you have to constantly adjust the ruffles as they flip up- in real life they don't stay all perfect like the picture! My daughter really likes this bedspread. I find the ruffles a bit annoying because they constantly need adjusting. It might help if the were sewn down. It's very pretty and the colors are true to the picture, but the quality is lacking. The ruffles are a flimsy fabric. The quilt seems a decent quality. I give it four stars because my 7 year old daughter loves it! My daughter loves this quilt. So soft and warm. Super fast shipment. Exactly as pictures and descriptions. Good quality and design as pictures. Highly recommend this quilt set ! Will shop this site again for sure. This sums up my daughter's personality perfectly! 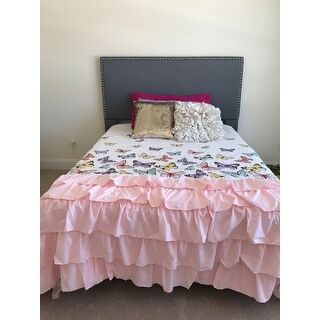 She loves ruffles and butterflies - and the colors are very pretty! Only thing is that is seems a little large for a full size bed - but other than that - we love it! This comforter is so adorable for a little girl!! And it holds up through the wash. I would highly recommend this set!! It is gorgeous and looks great! The only thing I don't like is that I got the full/queen size and it's really short on the sides on my daughter's queen bed. Only goes down about a foot on the sides and stops about a foot from the top. Regardless, I'm very happy with the quilt and would buy again and again. Very Beautiful and colors are sharp and pretty. My daughter loves this set so much that I have ordered her the larger one since she is upgrading to a bigger bed. Very pretty and lovely with the matching curtains. This bedding was beautiful!! It was just as described and came very quickly. I ordered a queen size for my daughters twin bed and it was perfect. Beautiful, light weight, perfect for summer. "Is the dark color on the butterflies black or brown? Thanks!" "Online the quilt looks like it has peach ruffles. Someone posted a photo and the ruffles on theirs looked pink. Are the ruffles peach or pink? Also, does the quilt really look as pretty is it does online? " Where did you find the matching curtains? "Is this a fairly white color or is it more off white...trying to decide if I need beige/cream colored curtains or more white...?" This is much closer to a cream (off-white) color.